The new SMC2335W offers an auto-fallback feature in both 802.11a and 802.11b mode under noisy environments and enables a larger wireless operating range. To secure wireless connections, the 2.4 GHz/5 GHz Universal Wireless Cardbus adapter supports 64/128/152-bit Wired Equivalent Privacy (WEP) in 802.11a mode and 64/128-bit WEP encryption in 802.11b mode as well as Advanced Encryption Standard (AES). In addition, this Universal Adapter supports major Operating Systems such as Windows 98/ME/2000/XP. 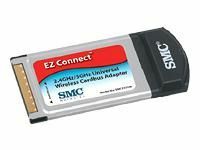 Combine all of these features with Plug-n-Play support and you have the perfect 2.4 GHz/5 GHz Universal Wireless Cardbus Adapter to seamlessly integrate into a new or existing wireless network.